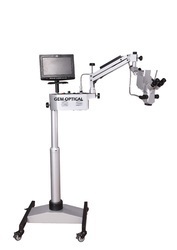 Our various models like Operating Microscope for Veterinary Surgery, Veterinary Microscope, Surgical Veterinary Microscope, Binocular Veterinary Microscope, Table Clamp Microscope, Beam Splitter, Camera Attachment, Binocular Tube, Assistant Viewing Binocular Tube, Beam splitter attachment for CCD Digital Camera and observation tube & assistant scope etc. Surgical Veterinary Operating Microscope offered comprise different precision operating microscopes that find usage in conducting different surgical procedures including that of Veterinary Surgery. These Surgical Veterinary Microscopes can be made available in different operational choices including that of Optical Heads, Eye Pieces, Eye Inclination, Inter pupillary Distance and others that deliver best possible functionality in given usage areas. We can also custom develop these as desired by the customers. Weight : 65 kgs. Approx. Veterinary Surgical Operating Microscope offered are made available in different functional options so as to provide a best match to the involved surgical, post operative surgery and diagnosis support as required in involved veterinary applications. 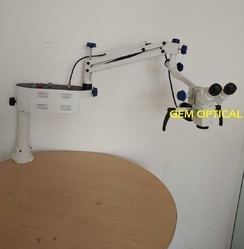 Here, we can provide customers different model choices that are different in terms of operating usage including of Optical Heads, Eye Pieces, Eye Inclination, Inter pupillary Distance and others. Further, we can also customize the provided support as desired by the customers. Portable Veterinary Surgical Microscopes offered are backed by latest process technology support so as to provide highly functional usage in given applications. 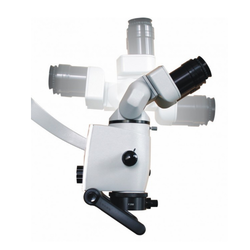 Made available in different microscope functional choices including choice of Optical Heads choice of Eye Pieces including wide field 10x that is individually adjustable, superior eye inclination of 90º as well as adjustable inter pupillary distance from 54mm to 75mm and other related options also make these models the best available in the markets. Weight : 35 kgs. Approx. Looking for Veterinary Microscopes ?